We recognise that relationship difficulties affect children and young people too. Our 'Young People's counselling' is designed to support children aged between 10 and 21 years. You can expect to be helped by a supportive and non-judgemental counsellor, either at your local Relate centre, at a venue near your home or you might see a counsellor in your school. What you say is confidential unless the counsellor is worried for your safety. Many of our young clients tell us they feel happier after they have seen a counsellor and are better able to deal with their problems, whether at school, at home or in your personal life. To book an appointment, please call us on 01604 634440 or email us. View the report on the positive impact of counselling for children and young people here. Our service supports children in one-to-one therapeutic sessions who are adversely affected by traumatic life circumstances, including family change or breakdown, loss or bereavement, or other social or environmental difficulties with which they feel they require additional help. Children will recognise their own abilities to cope with disruptions which may occur in their family life. Children will experience the counsellor as validating their feelings, and enabling them to tell their story in whatever medium works best for them. To book an appointment please call us on on 01604 634400 or email us. Therapeutic group work is for children aged 5-10 years and focuses on the exploration and resolution of difficult issues, so that the children involved can modify their beliefs, attitudes and behaviours. The aim of therapeutic group work is to provide an accepting and safe space for the child to work through the challenges they are facing through play, often unconsciously, to bring about their way forward and resolution. Therapeutic group work (maximum size 6 members) will focus on an experience/ difficulty common to all group members. The group will run for a set number of weeks, will be structured and will follow a particular group plan or programme. Each session will last between 40 and 50 minutes and will be facilitated by a trained and experienced practitioner. Children will be able to both recognise and draw strength from their own resources, abilities, and creativity in order to live more fully and contentedly within the appropriate age and stage of their development. If you are interested in commissioning Relate Northamptonshire to deliver group therapeutic work in your venue, please contact Appointments, on 01604 634400 or click here to email. 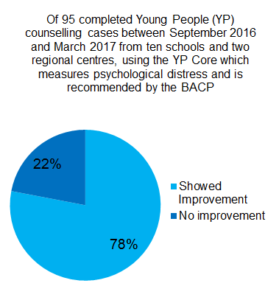 Nine middle and upper schools across the county currently commission Relate Bedfordshire and Luton directly to deliver regular confidential, face to face counselling on their school premises. The service is available to young people who are experiencing personal, emotional, and/or mental health difficulties that cause distress. By commissioning the service directly in school, college or University, staff can be assured that their students will access counselling support more easily and quickly on their school premises. The service cost includes management, individual and group supervision, administration, Counsellor CPD, expenses, monitoring outcomes, quality assurance and all professional indemnity insurance cover. Relate also offers a comprehensive PSHE program for KS 3 and KS 4 focussing on healthy relationships. If you would like to discuss having a Relate Bedfordshire and Luton counsellor in your middle or upper school, college or University on a regular basis, please contact Appointments on 01234 356350 or click here to email. "I didn’t think counselling would work for me, but it has changed my life"
"Offering someone to talk to who won’t judge has calmed me down – the help with anger/anxiety has been really useful"
"I attended this service, I found it easy to open up to someone that is neutral to my situation. This service helped me to gain a greater understanding of myself." "What difference has the service made to you? - Lots! Relationships are better. Worry and stress are heaps better, anger has got less frequent, school work is better by a little bit. HAPPIER :-)!!"